According to award winning children’s book author Donna Gephart, “Friday was the best school visit I’ve done in 8 years. And I’ve had some wonderful ones…These middle school kids inspired me with their creativity, their kindness and their awesome nerdiness.” That’s right, Donna Gephart, author of Olivia Bean, Trivia Queen, one of this year’s Florida Sunshine State Young Readers Award nominees, and My Mother Is Running for President!, which won the Sid Fleischman Humor Award, said she “couldn’t have asked for a more attentive, engaged group of diverse kids.” Mrs. Gephart shared her humble beginnings in Philadelphia and the bumps along the way to her becoming a published author. 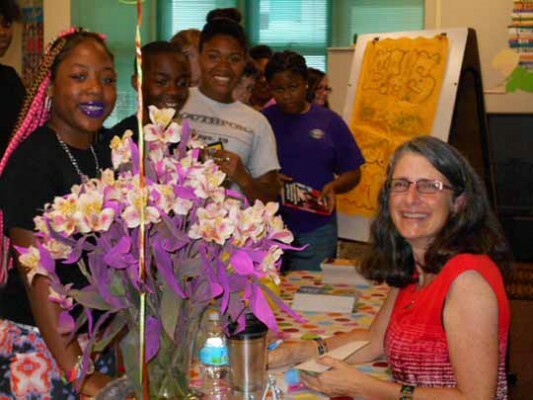 She stayed over an hour after her talk to meet the long line of students and sign copies of her books, donated by Southport’s generous Young Authors Coordinator, Mrs. Wanda Galey.